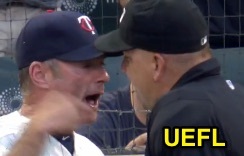 HP Umpire Jeff Nelson ejected Twins Manager Paul Molitor for arguing a strike three (check swing) call in the bottom of the 6th inning of the Yankees-Twins game. With two out and three on, Twins batter Aaron Hicks attempted to check his swing on a 3-2 slider from Yankees pitcher Adam Warren for a swinging third strike. Play was reviewed and adjudicated by the UEFL Appeals Board (8-0-0), the call was correct. At the time of the ejection, the Twins were leading, 5-1. The Yankees ultimately won the contest, 8-5. This is Jeff Nelson (45)'s first ejection of 2015. Jeff Nelson now has ? points in the UEFL Standings (3 Previous + 2 MLB + ? Call = ?). Crew Chief Jeff Nelson now has ? points in Crew Division (5 Previous + ? Call = ?). This is the 135th ejection of the 2015 MLB Regular Season. This is the 61st Manager ejection of 2015. This is the Twins' 3rd ejection of 2015, 5th in the AL Central (KC 10; CWS, DET 5; CLE 4; MIN 3). This is Paul Molitor's 2nd ejection of 2015, 1st since June 10 (Mark Ripperger; QOC = N [Balls/Strikes]). This is Jeff Nelson's first ejection since March 29, 2015 (Terry Pendleton; QOC = U [Balk]).